Siegesbeckia orientalis L. (Fam. Asteraceae). Botanical Name: 1. Siegesbeckia pubescens Mak. ; 2. Siegesbeckia orientalis L.; 3. Siegesbeckia glabrescens Mak. (Fam. Asteraceae). 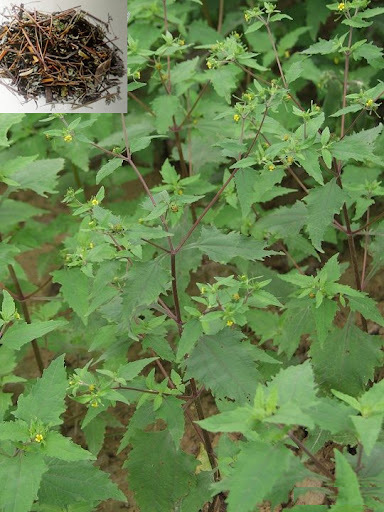 Herba Siegesbeckiae is produced chiefly in Hubei, Hunan, and Jiangsu provinces. Collected in summer or in autumn, it is cleaned, dried in sunlight, and sliced. The herb is used unprepared or steam-baked with wine. Functions: 1. To dispel wind and dampness; 2. To clear the meridians; 3. To clear heat and release toxins. 1. Wind-damp obstruction syndrome manifested as rheumatic pain. Siegesbeckia (Xixiancao) can be used singly or with Glorybower leaf (Chouwutong) in the formula Xi Tong Wan. 2. For rubella, Boils, carbuncles, furuncles, eczema and measles. The herb is used both internally and externally. 3. Hypertension. Siegesbeckia (Xixiancao) can be used singly or with Glorybower leaf (Chouwutong) and Uncaria stem (Gouteng). Dosage: 10-15 g. Use steam-baked Herba Siegesbeckiae for arthritis and unprepared Herba Siegesbeckiae for skin infections. Cautions & Contraindications: This herb is contraindicated in cases with deficient blood syndromes.